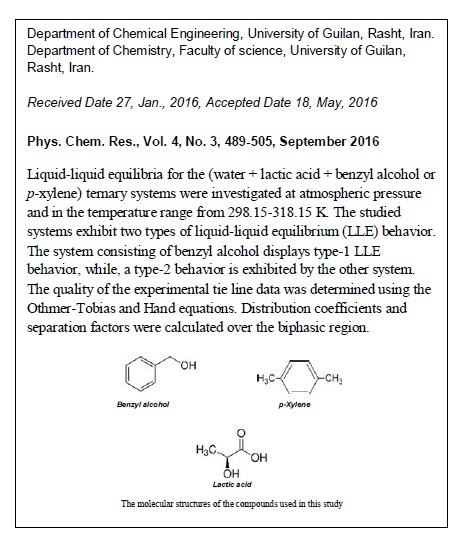 Liquid-liquid equilibria for the (water + lactic acid + benzyl alcohol or p-xylene) ternary systems were investigated at atmospheric pressure and in the temperature range from 298.15-318.15 K. The studied systems exhibit two types of liquid-liquid equilibrium (LLE) behavior. The system consisting of benzyl alcohol displays type-1 LLE behavior, while a type-2 behavior is exhibited by the other system. The quality of the experimental tie line data was determined using the Othmer-Tobias and Hand equations. 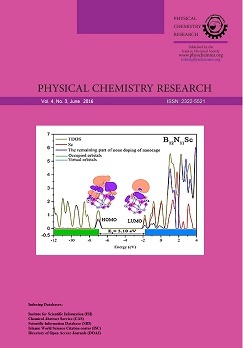 Distribution coefficients and separation factors were calculated over the biphasic region. The experimental tie line data were regressed using the UNIQUAC and NRTL models and the binary interaction parameters were obtained.